In the darkness of the storm's shadow, only truth can light her way. Having escaped Egypt with the other Hebrews during the Exodus, Shira is now living in freedom at the foot of Mount Sinai. When the people rebel by worshiping a golden idol, the ensuing chaos gives Shira an unexpected opportunity to assist a midwife. When the experience awakens a new desire in her, she defies her mother's wish for her to continue in the family weaving trade and pursues her heart's calling as an apprentice midwife. I have been anxiously awaiting this book. I fell in love with the first book in this series, Counted with the Stars. It was a fresh perspective on the story of Moses. I enjoyed the idea and thought. 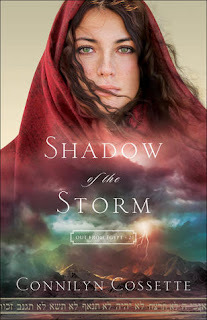 Book two in the Out of Egypt series, Shadow of the Storm, picks up right where book one ended, which I was thankful for. Shadow of the Storm follows Shira, a young Jewish woman we met in book one. She was a wonderful character in Counted, and I was very happy to have this book expand into her story. Shira is a strong woman. She lived as a slave in Egypt, now she is free and traveling in the dessert with her family, and the rest of the Jewish people who escaped. We open this book at the base of Mt. Sinai. Shira and her family are hiding in their tent as the revelry at the base of the mount grows, as the people celebrate the golden calf. Shira and her family await Moses' return. When he does, the people who participated are dealt with and the community moves on. However, some people haven't moved on from the night that they loss parts of their family. We follow Shira as the time moves on. Shira was raised knowing her moms talent, but since coming out of Egypt, Shira was introduced to her aunt's profession and she knew that was her calling. Following her through her training and watching her grow in many ways was a fantastic journey. I can not wait to see how this series wraps up with book three.